1- Navigating the sea from the headquarters of TIMOROGO, between mangrove islands, up to the exit of the creek that is the next step of the way. 2- Navigating a creek between coastal mangroves and surrounded by lush tropical trees and plants, to a small dock where it ends this stage. 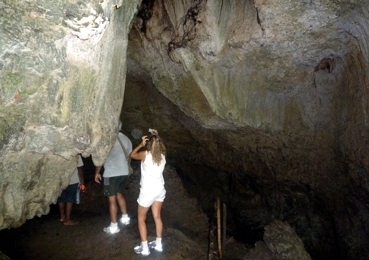 3- Walking through the rainforest on the Bastimentos island, entering the Marine Park, and enjoying the flora and fauna, especially birds, sloths and crocodiles, until reaching the entrance to the cave of bats. 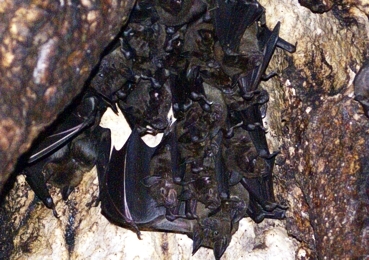 4- Entering the bat cave, an ancient coral reef emerged from the sea during ancient earthquakes, which have formed stalactites and where hundreds of bats live in holes in the ceiling of the cave. The path leading to the Bastimentos Lagoon is not easy, with hills to climb that require a great effort by the hiker but, in compensation, it is possible to see a lot of birds and other animals of the rainforest, like sloths, monkeys, armadillos and others.